Sinusitis is a very common condition of which over 37 million American s are affected every year. Annually, Americans spend over $6 billion on health issues related to sinusitis. Sinusitis is the condition of swelling and inflammation of the sinuses. Sinuses are the cavities which are created by the facial bones surrounding the nose and are a part of the respiratory system. Symptoms of sinusitis may include a sensation of pressure in the face where the sinuses are located, post nasal drip, congestion, runny nose, sore throat, cough, thick nasal drainage, and often perpetually worsening symptoms after 5 days. The sinuses allow for the natural drainage of mucous, and an inflamed or affected sinus cavity will not allow for the normal draining of mucous from the sinuses, causing pain, pressure, and a general feeling of being ill. The sinuses are known for draining about one and a half liters of mucous daily. 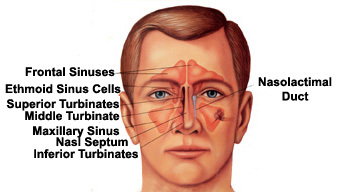 Causes of sinusitis vary about as much as individuals experience sinus symptoms. However, the most common causes of sinusitis include allergies, the common cold, exposure to environmental irritants, a deviated septum, exposure to either second or first hand cigarette smoke, nasal polyps, sensitive sinuses, immune system deficiencies, asthma, cystic fibrosis, immotile cilia syndrome, and bronchiectasis. Risk factors for sinusitis include environmental factors as well as allergies and a high level of mold, dust, dander, or pollen in the air or the environment. Once an individual has experienced sinusitis, with the exception of sinusitis related to the common cold, they are considered twice as likely to experience it again or repeatedly. Diagnosing sinusitis can be a little tricky, as whether it is caused by an allergen, a virus, or a bacteria, the symptoms present identically. A physical examination, including a careful inspection of the nasal cavity, is required while trying to determine the cause of the sinusitis. A nasal endoscopy may be performed, which is a nasal passage examination tool with a small camera attached to it to allow a physician to inspect the interior of the nasal cavity. Based on inflammation, the color of the mucous discharge, and a patient medical history, the physician can typically make an accurate diagnosis concerning the cause of the sinusitis. A basal swab may be helpful in determining the cause as well. Acute cases of sinusitis typically need no further investigation. However, chronic sinusitis may need a more detailed image in order to determine the best course of treatment as well as the cause of the chronic condition, and in these cases a CT scan of the sinus cavity may be recommended. There are various treatment options for sinusitis, each depending on the cause of the condition and the severity of the condition. Where appropriate, antibiotics help clear up an acute case of sinusitis, however antibiotics are typically over prescribed for this particular condition. Antibiotics treat only bacterial infections. Nasal washes help alleviate some discomfort and clear out the sinus cavity. They also help to clear out bacteria that may be causing the sinusitis. Steroid nasal sprays are designed to help alleviate inflammation, swelling, and even in some cases an over production of mucous. Depending on whether the sinusitis is chronic or acute, a steroid nasal spray may only be needed periodically or may be required for daily control. Decongestants help to dry up the extra mucous and allow the patient to breathe a bit easier. Decongestants tend to either create sleepiness or hyperactivity. Adversely, antihistamines are specifically designed to decrease the chemical reaction in the body which helps in the over-production of mucous. Antihistamines are recommended for chronic cases of sinusitis that are caused by allergens while decongestants are typically recommended for cases that are caused by a virus. Pain relievers are helpful in reducing fevers and relieving the painful pressure associated with sinusitis. Severe cases, and cases involving nasal polyps need a systemic steroid to help control the inflammation. These medications are typically recommended by the physician depending on the cause of the sinusitis. Not all medications will be effective on all cases of sinusitis. For serious cases of sinusitis and stubborn chronic cases, there are surgical procedures available which can alleviate the painful swelling and general discomfort associated with this condition. This includes conditions that have persisted for extended periods of time without effective relief from other types of therapies or treatments. Surgically altering the sinus cavity has proven effective for patients without relief from other forms of treatment. Complications related to sinusitis include snoring, nose bleeds, visual problems, chronic headaches or migraines, and difficulty being physically active due to difficulty breathing. Sinusitis is a very common problem, but that doesn’t make a patient’s discomfort any less valid. The pain and inflammation associated with sinusitis can be very restricting and life inhibiting. It is important to have sinus problems addressed by a physician in order to retain a much higher quality of life that can perhaps even be pain free.